Here it is, my first giveaway. I was wandering around bloggy world the other day and happened to find The Apronista. She was gearing up for an apron giveaway and invited others to join in. I decided it might be fun to see who would be interested in one of my little creations. Here is the apron up for grabs. I used what I had left of Paula Prass' butterfly fabric mixed with some others from the stash. This is the "Cup Half Full" apron from Anna Maria Horner's book, "Seams to Me." Here is a detail shot of the pocket with lace. Check out the other aprons up for grabs here. Enough about the apron, on to the skirt. I used Jona's pattern, the Evelyn Apron Skirt, from the wonderful Fabritopia. I love, love this pattern!!! The fabrics were all leftovers from this, this, and this. I love putting every last bit to use. Here is a shot of the cute peek-a-boo border. The swan lace I was lucky enough to inherit from a friend that needed to reduce her stash of vintage fabrics and trims. Thanks Katy, you rock! Your aprons are adorable! Please enter me, I'd love to own one! As for dinner, a good hamburger can't be beat! Love the apron!! The skirt is adorable, too! My favorite dinner is steak, a baked potato and a lettuce salad! Yum! So cute! Thanks for the giveaway. Since I haven't made breakfast yet, I'm thinking about breakfast burritos - yum! That and German pancakes are my favorites. I want to win your apron so I can put it in my granddaughter's hope chest! Cute apron ... and the skirt is adorable, too. For dinner, I love to make homemade pizza ... and my family loves to eat it! 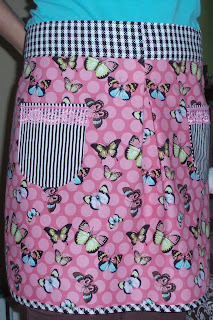 If I win your pretty butterfly apron, I think I'll be forced to share it with my girls ... they'd flip over it LOL! Both are so sweet. I love, love, love the lace! What a great idea. I love anything Italian, Manicotti has to be my favorite thing to make because I'm literally counting down the minutes before I taste the amazing meld of cheesy goodness. Fav dinner...hmmmm, so many but the most recent would have to be...Take n' Bake Pizza on the BBQ. Yummy and FAST! Dinner ... Springfield Style Cashew Chicken. It originated in Springfield, MO and is breaded and deep fried chicken pieces served with a homemade oyster sauce, steamed rice, green onions and cashews. Great! Now I'm hungry! Lunch is two hours away! Don't worry, I make it! Your aprons have SO much personality. Would be delighted to win one! Your aprons as so lovely! My favorite thing to make for dinner is a roasted chicken with potatoes and roasted veggies. YUM! I love all the details you put on your creations. Very cute! The apron is so bright and pink and butterflies. I have a little girl in this house who loves butterflies. I love this apron! Although if it comes to our home I doubt I would get to wear it as butterflies and pink are my daughter's favorite and she loves to help in the kitchen. My favorite thing to make is spaghetti! I use my favorite sauce and it cooks all afternoon in the slow cooker. it is a never fail kind of thing and the leftovers freeze beautifully. My favorite thing to make for dinner? Steak on the grill. I do the sides, my husband does the grilling! that is just too cute. would love to sport that around my kitchen! My fav thing to make for dinner is "cornflake chicken" or anything you can just pop in the oven! thanks for the chance to win! anne molino at hotmail dot com! What a cute apron, I love the pockets! My favorite dinner is pulled pork sandwiches with coleslaw. Cute aprons. My favorite dinner is lasagna. And it is one my that my entire family also loves, which is very rare. You did a great job with your aprons. Please count me as one who wants an apron. I love to use my crock pot, especially for chicken dishes. That is so fast and easy. cute apron. I have a terrific Fettuccine Alfredo recipe that I love making for dinner. It's great to meet you through ApronFEST. I am giving an apron away as well! your creations are darling! Love the skirt! Isn't Jona fabulous?!? Love her and her shop! You might inspire me to join apronista. As for dinner, tonight I'm making chicken enchilladas. Unless I find the recipe for lovers chicken. Then I'll make that instead. I love the butterfly apron. I know what you mean by not letting go of an apron. Aprons are like books, they become a part of you. That apron is so cute!!! My favourite thing for supper is whatever somebody else has cooked!!! I love bbq ribs though. Your apron is so darling!! Please enter me into your giveaway. Our new favorite dinner idea is "Crockpot Sundays". The kids love to look at recipes and choose something yummy! Not to mention how great the aroma is in the kitchen the whole afternoon!! I love butterflies and I love your apron! The lace detailing adds so much. One of my favorite dinners is bow tie pasta tossed with a little EVO, and lots of fresh veggies too. Our fabric combinations are delightful! My favorite meal these days is a raw recipe for a nut pate to serve on green bell peppers. Cucumber, almonds, sunflower seeds and walnuts blended in a food processor with a little lemon juice. Fabulous! Such a cute apron! very cheery! Lovely apron! So colorful! My favorite thing to make for dinner? Hmmm... This time of year I love making marinated salmon on the grill. So yummy. Love the apron! And that swan lace is fabulous - you scored on that hand-me-down! As for dinner, the taco-ring from pampered chef is always a favorite at our house - easy to make and oh, so tasty! what a pretty apron! This summer my go to dinner has been grilled chicken and salad. Plus, I use the leftover chicken for sandwiches or enchiladas or pot pie! I know what you mean about hating to "let it go." I had a hard time picking one of my vintage aprons for the giveaway, but it's awfully nice sharing with those who appreciate the gesture (and the work / love that goes into creating something by hand). My favorite dinner is grilled salmon -- with someone else cleaning the grill. Thanks for participating. Beautiful apron. Thank you for the chance to win it. These aprons are gorgeous and so feminine! Thanks for the chance! That apron is so darn cute! I love to cook anything from the farmer's market this time of year. Fresh vegetables are just so good! I love this apron. It is so unique. I would love to win it! My favorite dinner is pork chops with a baked potato. Favorite dinner- Orange roughy on the grill with fresh skewered veggies! Your blog is so beautiful. My favorite dinner is cupcakes. Can you please include one if I win? I want an apron. I like to make fajitas or tomato curry. Too cute! I think you have lovely little creations and I'm sure anyone would be happy to get one! As for dinner--well my favorite thing to cook is just some fresh veggies thrown in together with some chicken and lime juice in a crazy stir-fry. It's so easy and if the veggies are good then you can't really go wrong! I love the apron and skirt! My favorite thing to make for dinner: chicken-and-black bean quesdillas. Thanks for the giveaway! Love your apron! How sweet and the colors are great! I love making anything mexican for dinner, especially enchiladas. I adore the way you piece your aprons together! They are very cute and unique. My favorite food for dinner is vegetarian lasagna! My favorite thing to make for dinner depends on the night ;) Tonight, for instance, it was pancakes, plain, with chocolate chips, and with fresh-picked raspberries off of our bushes. M M Good! Thanks for having a give-away. My favorite thing to make for dinner is pasta. It's the one meal that both my husband and boys always eat (and never whine about). That is one of the cutest aprons. I would love to win it. My favorite thing to fix for dinner is baked spaghetti and garlic bread. Thank you. I love to cook eggplant parm from scratch. Sauce and all. So darling! I love to make anything that's easy and my kids will love! My favorite thing to make is gnocchi con gorgonzola - an Italian favorite. It's easy but a bit time consuming, so I only do it about 6 times a year. Cute! Always a chocolate baker here. awesome apron! My favorite meal always involves a crock pot because I am a lazy cook. Comfort food of pinto beans and cornbread. Your giveaway would be perfect for my granddaughter whose birthday dresses matches the fabric! Imagine that! I would love to win this for my niece- it would match her birthday dress- imagine that! :-) My favorite dinner menu right now is grilled salmon, sauteed green beans, & baked sweet potatoes. Yummy! I would love that apron!!! I'll have to click around to see if you sell them... My daughter might NEED one!! Ooh, my goodness, butterflies are my thing! Beautiful! I have used Butterflies in adopted daughters room because butterflies means rebirth and I was waiting for her to come into my life! The apron is so pretty and fitting! My fav dinner is grilled Salmon and a salad with cranberries mixed in! What cute aprons! My favorite dinner is friend shrimp and fish.